LiveWell for LIFE wanted to put healthy, sustainable diets on the European Union’s policy map. And what better way to do that then to serve this up to our new MEPs? Better yet, why not demonstrate how to prepare this? It’s not every day you get to see a master chef in action – most of us will only see them our TV screens. But between October and December 2014 this is exactly what the members of the European Parliament in Brussels had the chance to do. We offered our MEPs the chance to join three famous chefs as they cooked up their very own LiveWell recipes. 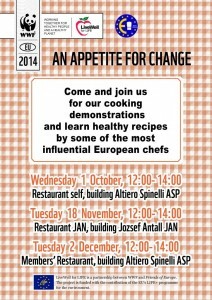 On Wednesday 1 October the LiveWell live cooking debut took place at Restaurant Self in the Altiero Spinelli building. Here, the renowned Spanish TV celebrity-chef Ramón Roteta presented the ‘bonito (or tuna) pot’, a delicious healthy, sustainable plate. This was followed by Belgian Chef Michel Lognoul whose live cooking show took place Tuesday 18 November, between 12-2 pm at the Restaurant in the Joszsef Antall building. Chef Michel cooked a ‘stuffed ballotine of cuckoo from Malines’. Last but not least: on Tuesday 2 December Chef Tulpinck John prepared a ‘green and coral lentil risotto with cream of chestnut and hazelnut oil espuma’ at the Members’ Restaurant in the Altiero Spinelli building. And it was definitely not all for show: a daily LiveWell dish was introduced at the Restaurant Self until the end of this year. 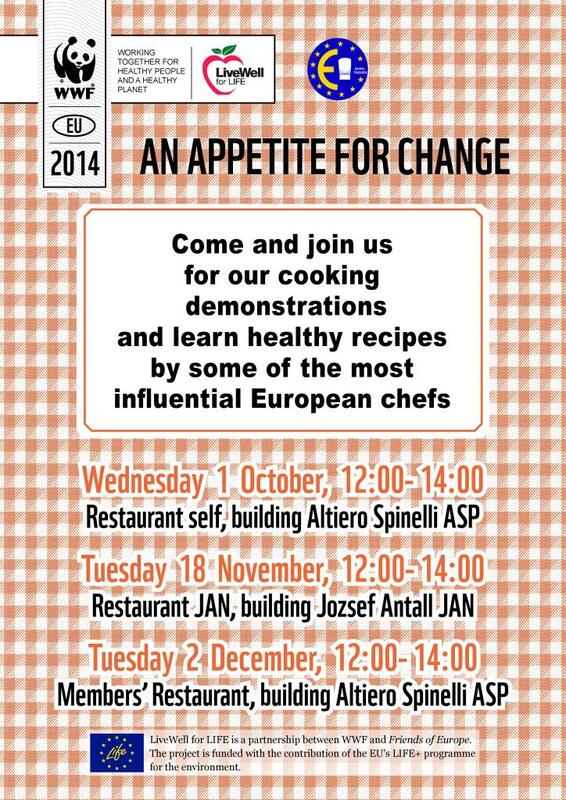 These cooking demonstrations were organised by LiveWell for LIFE, Euro-Toques, the European Chefs Association, and the Catering and Staff Shop Unit of DG INLO 1 of the European Parliament. Through the involvement of Euro-Toques International – which brings together some 2,000 cooks from all over Europe – we’ll demonstrated how tasty, low-carbon dishes can be easily prepared with fun.